It is with great pleasure and satisfaction, that I am holding A Guide to Documenting Learning: Making Thinking Visible, Meaningful, Shareable and Amplified in my hands! I could not help myself capturing the moment I received the first hard copy from the publisher. The book has been in the making for over 10 years as I was working in the classroom as a world language teacher, later on as a technology integration facilitator, then 21st century learning coach and now through my work as a consultant and learning coach. Together with my co-author Janet Hale, it took over a year to write. You can read more about that time in When a Blogger Writes a Book, where I documented (!!) the process and my learning. If you are considering reading, reading or already have read the book, Janet and I have a companion website to serve as a hub to connect, share and amplify the documenting learning experiences, tips and resources. You will also be able to find a Bonus Chapter, a Blogging Challenge and Discussion Questions. By contributing, you will connect with other readers, put into practice what you are reading in the book and become part of crowdsourcing best practices in documenting learning from around the world. Check A Guide to Documenting Learning out on Amazon or directly on the publisher’s Corwin Press site. We would really appreciate, if you leave us a review, document your thinking and learning as you are reading the book. 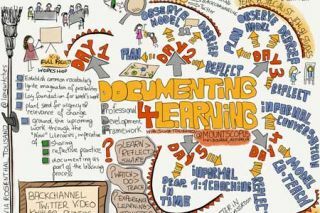 We are looking forward to seeing you share your own documented learning journey in turn on Twitter, Facebook and Instagram using the #documenting4learning hashtag; or by mentioning @documenting4learning on Facebook or Instagram, and @doc4learning on Twitter. Janet has been sharing selected quotes from the book on social media to whet your appetite for more Documenting Learning :).